A model of the Norfolk Southern Railway’s First Responders Train is the newest addition to my growing collection of G-scale model trains. This is one of ten variations of the GE Dash 8 locomotive that you can get from MTH Trains, my favorite manufacturer of G scale model trains. I’ve found that MTH trains are the highest quality, in spite of selling for significantly less than LGB brand products. In short… a great value! 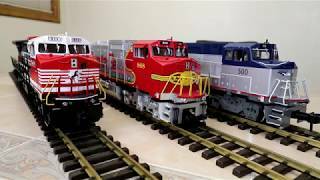 I now have three varieties of the GE Dash 8 locomotive in my collection. Besides the new Norfolk Southern locomotive, I also have an Amtrak passenger train and a Santa Fe engine. So, that leaves 7 other variations of MTH’s Dash 8 still to be collected! Notice that the Santa Fe locomotive is pulling 17 rail cars behind it. I think that’s the longest train that has been in any of my videos, so far. James The Red Engine also makes a cameo appearance in this video. James arrived at around the same time as the First Responders locomotive, and my next video will focus on James and his friends, Thomas and Percy. If you’re interested in purchasing any of the trains you see in this video, I’d recommend Trainworld.com as your best source… with a big selection at low prices. I’m not their spokesman… just a fan who’s bought a LOT of model trains from them!